"Iliahi," a red alabaster and wax crayon sculpture by Leland Miyano, discusses the Hawaiians' first venture into commerce Western-style, when their engagement in sandalwood trade nearly depleted the tree supply on Molokai. FOR artist Leland Miyano, everything is a continuum, and all things are interconnected. The Hawaii artist, recipient of the Catharine E.B. Cox award, is showing his latest work at the Honolulu Academy of Arts in "Historia Naturalia Et Artificialia," has been a lifelong maker of art and a conservator of nature. As a landscape designer, Miyano has created a carefully planned self-sustaining garden on an acre of land at his Kahaluu home; as an artist, his works are always intended to be environmental statements. For Miyano's current show, "the gem of my idea was inspired by the cabinets of curiosity that (came into existence) when science was just becoming organized," he says. "'Historia Naturalia Et Artificialia' is Latin for 'natural and artificial history,' and the title is a statement on man's relationship with nature." 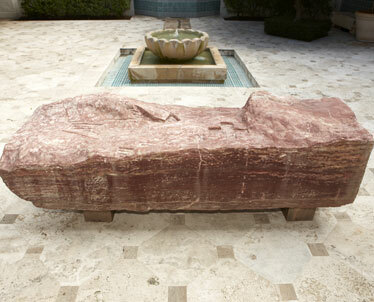 "My work has lots of microcosm and macrocosm (connections)," he says in discussing "Iliahi," a sculpture made of red alabaster. The work references the sandalwood tree trade that took place on Molokai centuries ago, when the tree supply was nearly destroyed. 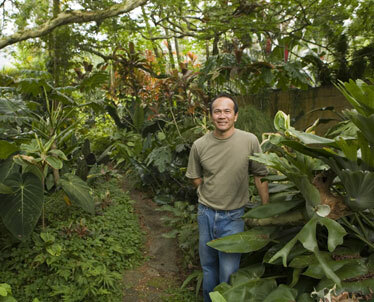 Leland Miyano, a naturalist, artist and landscape designer, at home in his garden in Kahaluu. "My whole thing is that everything in life is interconnected," he says. "Everything I do centers on my relationship with the Earth. I was always collecting, recycling and reusing, even as a little kid." The piece itself loosely resembles Molokai in shape and is built layer upon layer the way our islands were with volcanic rock. The topography of the stone bears miniature carvings of ship shapes that mimic the holes Hawaiians dug into the Molokai earth; they replicated the actual size of ships and filled the hole with logs to determine the amount of sandalwood needed for construction. "My works have layers of information," Miyano says, "like a poem or a novel, depending on how many layers you want to extract." Miyano will be discussing his exhibit, on view through Aug. 24, at 10 a.m. July 5. Call 532-8700. The academy is open 10 a.m. to 4:30 p.m. Tuesdays to Saturdays and 1 to 5 p.m. Sundays. Admission is $10 general; $5 seniors, students and military; children under 12 is free. 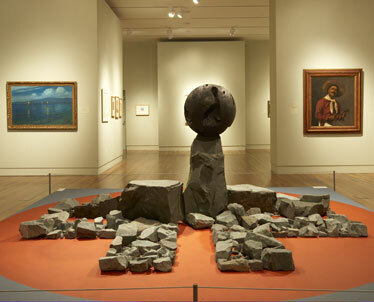 "Volcanic Heart," is a basalt and wood installation. 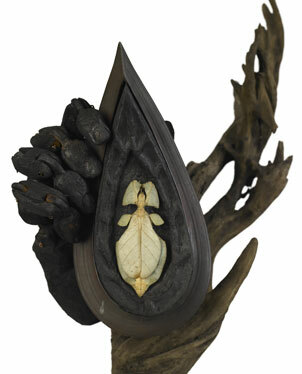 Miyano utilizes burnt redwood from a recycled fence, along with copper, driftwood and leaf insect for "Ars Sacra."